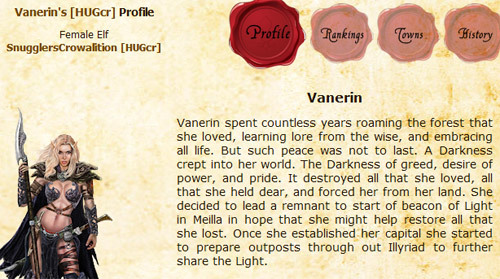 This month’s Player Spotlight focuses on wonderful Illyriad guide writer, frequent global chat new player guide linker and new player question answerer, Vanerin. We all appreciate Vanerin’s positive impact on the community and welcoming presence in game. Learn more about the Player Spotlight program at our website and nominate players by sending an email to community@illyriad.co.uk. Now on with the interview! Well on the 13th of August 2011 I was having a slow day in between projects. Google Chrome suggested I look at its app store and there was this curious game called Illyriad listed. I decided to try it out and have been happily addicted ever since! Nope, this is my first one! I feel kinda lucky to have found such a great game right off the bat. I have some talents, but you are right in using the word hidden. You have to look reeaallly closely to find them. 😛 I thoroughly enjoy music and art though. I play the piano, kazoo, cello, mandolin, and a little bit of the guitar. As for art, I mostly work with sterling silver to make jewelry. The amazing community, the life the devs bring to the game, the depth, and the evolving nature of the game. You devs have done a wonderful job in all of those areas! All of the people! I am probably going to start sounding like a broken record, but there is a great community here. I really like how the game facilitates becoming friends with each other. So many things/places in the world puts people at odds against one another, so it is nice to get a breath of fresh air with the encouraging environment. Hmm, I am probably the most proud of being in HUGS. It is really a great alliance filled with wonderful people. And I consider myself fortunate to be among them. Factions! I can’t wait for all the options and paths that will open. In my opinion, Illyriad has a wonderfully deep combat system. But it seems a pity that combat is the only area that has that level of complexity. It would be really cool to see diplos, magic, and trading with a wider range of possibilities. Talk in Global Chat!!! There are some really cool people playing here and we all would love to meet you!